All yardage will come in a length of 1 yard. Change the quantity in the shopping cart for additional, continuous yardage. All yardage has a width of 54 inches, except Black Dot Vinyl, which comes in sheets of 27" by 60". 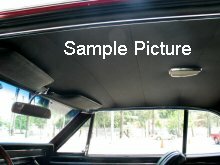 Stock Interiors is proud to offer the highest quality aftermarket VW Dasher headliner kits and headliner material available to the industry. All headliner material yardage is the same high quality material that our sewn headliner kits are made from. If you purchase your extra yardage at the same time as your Volkswagen Dasher headliner kit, then your headliner material will be cut from the same roll, assuring you of a perfect color match.